Report: Fernando Alonso was third this evening, just as he was in the first session in Bahrain. The Spaniard stopped the clocks in 1.35.360, completed 28 laps. Fernando and the entire field managed to improve their times considerably in the second session. That was down to a cleaner track, but most of all to a drop in temperature after the sun set. 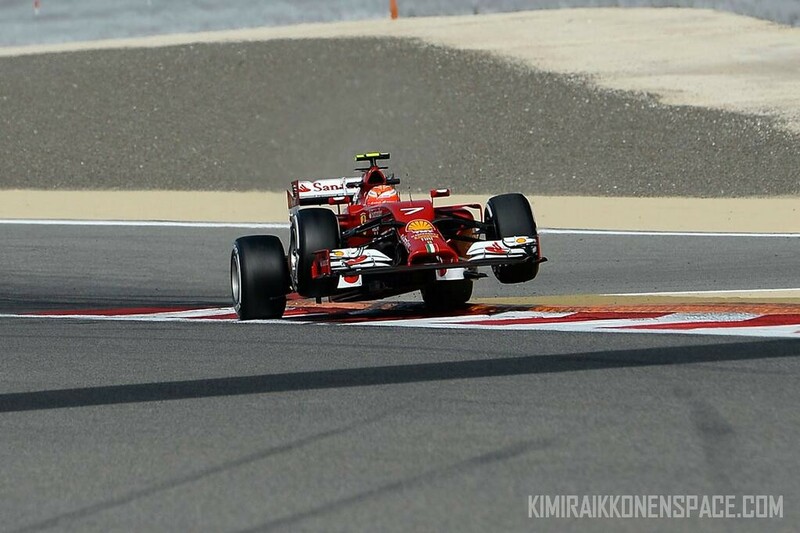 Kimi Raikkonen had a more complicated time this evening, still not getting the F14 T to his liking. The Finn’s best time was a 1.36.366, which was good enough for 14th place. Over the final 35 minutes of the 90 available, the Finn, like all the others didn’t bother chasing lap times, but concentrated on a long run, using the Medium tyre to run a comparison with Alonso who used the Softs up the final minutes. Kimi did 33 laps. Once again Lewis Hamilton topped the time sheet in 1.34.325 ahead of Mercedes team-mate Nico Rosberg, who was over three tenths down. Report: Fernando Alonso and Kimi Raikkonen were third and sixth respectively in first free practice in Bahrain. Fernando did 17 laps at the wheel of his F14 T with a best of 1.37.953, four tenths off the pace of fastest man, Lewis Hamilton who did a 1.37.502 with his Mercedes team-mate Nico Rosberg second. Raikkonen’s best lap was a 1.38.783, although he only managed 12 laps. Finn hit a kerb very hard and had to pit so the floor of the car could be checked. Air temperature was 25 with the track at 45, but that’s likely to change significantly in the second session, which will run in the dusk, seeing the floodlights brought into play for the first time here. The session starts at the same time as tomorrow’s qualifying and Sunday’s race, so it will be a useful exercise. Kimi’s fastest lap time gap to Alonso is 1 second!!! That is quite big… sweat! As a kimi fan, I do hope that this doesnt become the norm on Fridays. If kimi keeps on getting it wrong on Friday program and waste pressure time on setting then we can all just kiss this season goodbye. Mercedes are hardly doing anything and they are just driving around for fun. I’m very dissapointed with Ferrari management, I expected better and faster. With the technical personnel and the infrastructure they should have resolved all the major issues in a relatively short time. 2 and a half races and still stuck in the mud….